We all can think of times when we've made a decision or taken an action that has radically changed our lives. One such time was when I broke my neck snow skiing. In a split second, I was paralyzed from the shoulders down and my life was forever changed. Another time was when I discovered the Bay Area Association of Disabled Sailors (BAADS). Often, life as a quad is not a lot of fun—there are so many things we physically can't do. I never thought I would be able to sail again, so when I first heard about BAADS, I was pretty skeptical. When I went to one of the monthly Sunday membership meetings at the South Beach Yacht Club, I assumed they would put me in a little dinghy and we'd just motor around the harbor. I thought people would look at me and ask, "Are we having fun yet?" But that's not what happened. On my very first day, I went out on a 27 foot Erickson keelboat which had a gimbaled (swiveling) seat in the back, so I was able to be safe and comfortable by staying level any time the boat heeled (leaned). It was a beautiful, brisk sunny day with plenty of wind, and the ocean was full of pelicans, seals and sea lions. From that day on, I was hooked. Storytellers for Good: Bay Area Association of Disabled Sailors from Storytellers For Good on Vimeo. BAADS is an all-volunteer nonprofit organization that strives to provide accessible sailing opportunities to people regardless of their disability, experience, age or financial resources. BAADS sailors use two types of sailboats: keelboats and dinghies. BAADS has 5 keelboats which have room for two to eight people. independently or with another person. Many of the sailors who participate on Saturdays also enjoy the competitiveness of racing (especially since there are so few competitive sports most of us can participate in). 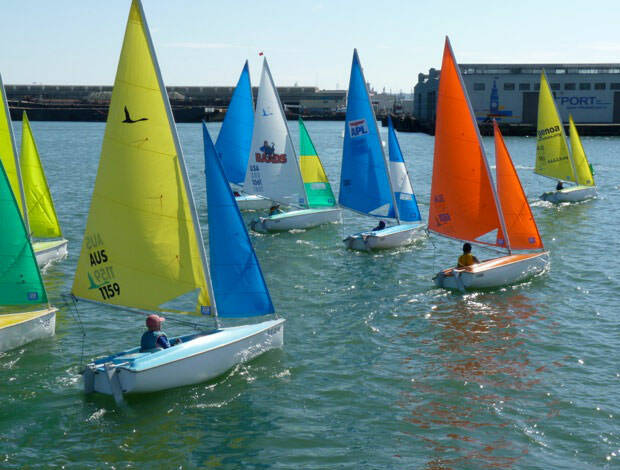 BAADS hosts an annual regatta for dinghies as well as sponsors monthly races. Our dinghies and keelboats have modifications and equipment enabling people with various abilities to sail. BAADS uses adaptive seating, electronic controls and other accommodations, so nearly anyone can handle the sails, steer the boats and operate other functions. BAADS Commodore Cristina Rubke has no use of her arms or legs and drives her wheelchair with her chin. Yet, she sails recreationally and also races in local, national and international competitions with both dinghies and keelboats just by using a joystick to control her boat. You too can sail independently or with others even if you have a disability. BAADS welcomes people with all experience, abilities and financial resources. Sailing is an exciting outdoor recreational activity which the entire family can do together. Two people can sail side-by-side on a dinghy or the family can go out on a keelboat with one of BAADS experienced skippers. And if you don't just want to be a passenger watching others have all the fun, you too can fully participate as an independent sailor, experiencing all of the freedom, excitement and control just like everyone else. We hope you will discover the thrill of sailing on the San Francisco Bay by becoming part of BAADS. We are an all-volunteer organization which operates most weekend days out of Pier 40 in San Francisco at the north end of the South Beach Yacht Harbor. See ya on the Bay!